At construction site, an inspector discovered a safety fall arrest harness with broken shock load indicator was in the work place and could have been used by anyone at site already. Strips were shock loaded with a force causing the strips to break. However, there were NO indication of falls involved. Hence, the belt was totally disposed from the site. Belts must be fully inspected by the wearer or user to make sure the strips are intact before each use. Harnesses shall be registered and every issued to site shall be inspected by a competent person prior wearing or putting it into use. Also, all harness after using it, MUST again be inspected by a competent person before returning it to store. Keep written records of inspections and approvals. Refer any questionable defects to your supervisor or check with the manufacturer. Toolbox talk on safety harness for users shall be conducted only by authorized and competent persons. The accident happened at construction building G+24 floor which involved one worker. The construction worker was fitting a duct inside a riser somewhere on the 7th floor at the same time a masonry team was also working on the same riser at the upper level that is on the 21st floor to be exact. As we all know by nature, accidents can happen anytime, anywhere unexpectedly. 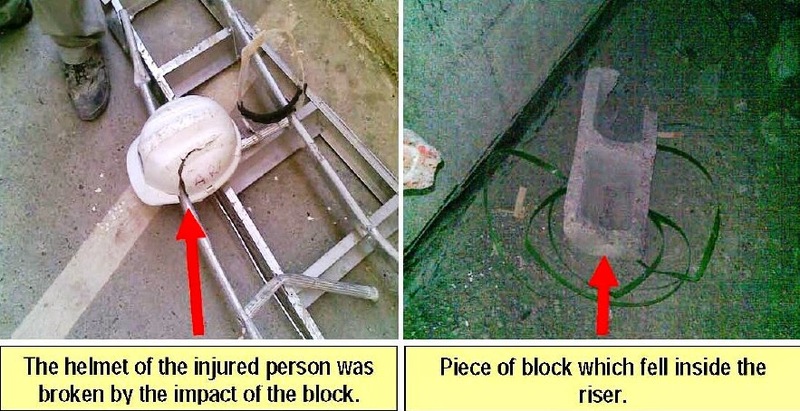 So what happened is, a hollow block fell from the 21st floor and broke the overhead protection which was covering the 9th floor and it continues to fall to 7th floor and hit the workers head (protected with hard hat). See actual photo below. The worker was hospitalized and suffered a broken bone on his shoulder caused by the impact of the hollow block that fell on him from 21st floor. He was given a 3 months leave. SEE THE IMPORTANCE OF THE HARD HAT !!! - A life saver !!!. If the worker was not wearing his hard hat at that time, he will be dead on the scene. It was found out later that the accident was caused by the failure and negligence of the main contractor who permitted a sub contractor worker to work inside a riser, however at the same time masonry works is going on at the upper level on the same riser. "Investigate to correct failure of the Permit To Work (PTW) and prevent the drop of equipment from height. Risk assessment must be reviewed to address corrective and preventative actions." 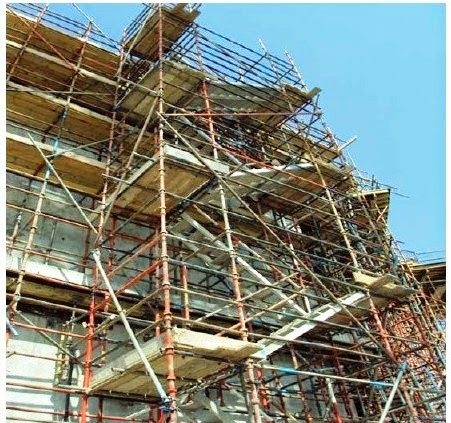 Erecting ladders in scaffolds, especially in high rise building construction requires good engineering methods in selection and method of erection. Portable ladders are used as a means of egress and access and at the same time presents risks of slips, trips and falls from height due to various human errors. Take note also that light materials cannot be moved up or brought down in portable ladders and is not suitable for particularly at the time of emergencies when more than one person may need to be evacuated. Considering the above photo, scaffolds with erected step ladders are shown for the improvement of everyone's project at site. Use of step ladders significantly reduces the risks and improves the safety of our workers at site as well. Please share this method to all contractors constructing high rise buildings and consider this as benefit. Investigators found out that the person acting as a banksman was not competent and failed to inspect the table form if it is safe and secured onto the "C" hook prior to lifting operation and also did not noticed that the tag lines were tangle on a nearby handrail causing the load to displace. Despite of the incident, there were no persons injured or harmed and luckily there's a safety net provided around the perimeter of the building that prevent leading to major accident. Regular inspection MUST be performed by safety officers and to be communicated to the engineer and foreman to ensure that only trained, competent and authorized persons will be working as banksman on any projects. Only trained and certified banksman to be appointed to control lifting operations throughout all projects. Additional training by Third Party and internal toolbox talks is also recommended to highlight the responsibilities and procedures to persons working in the position of banksman. Ensure all loads are correctly and properly secured and competent or trained banksman is appointed prior commencing any lift operations. "There is a suggestion that competent banksman must be identified through a different color either hard hat or uniform among others. Risk assessments must be carried out and communicated to all persons involved in the task. Method statements are required on how to carry out the task. Toolbox talks must be communicated to the workforce on the dangers and risks of lifting loads." The crane as shown photo above, overturned while lifting a 2 tonne load of cement bucket. The operator over reached the crane boom and the result was destructive. Fortunately no one was hurt or injured due to the fact the crane was prevented from falling over the edge of the excavation by the boom resting on the scaffolds. Positioning of outriggers with base plate on a compacted or rigid soil. Driver or operator competence (3rd party accreditation required). Ensure Confirmation Automatic Safe Load Indicator (ASLI) is working. Crane inspection certificate (3rd party approved). Job Safety Analysis (JSA) must be conducted. Approved lifting plan must be in place. Operator competence be able to read load chart inside the crane cabin. "The crane must be properly positioned in the first place. Improper positions will force the boom below the stability rating. However, the safety system of the crane (if working properly) should detect the crane going out of limits and should have displayed a warning to the operator. The load moment indicator must be operational, programmed correctly and not in the override position.The operator must also know how to read and understand it". Crane operations are common at construction site and represents one of most severe threats of property damage, injury or even fatal. Our human body has no match for a load suspended from a crane. The load is being lifted by a mechanical device operated by human being. We know that both are subject to limitations and failures. Despite of our best intentions, mechanical fails and humans make mistakes.